When you take out a mortgage on a home, you agree to make monthly payments to the lender over a certain period of time. Over time, interest accumulates on the loan. Accordingly, some of your payments cover interest due on the loan, while the rest of your payments will reduce the principal amount that you owe. Amortization refers to the periodic repayment of the loan over time. Taking out a mortgage is a big commitment, and it is important to consult an attorney about your obligation and whether there are any ways to turn the amortization schedules to your advantage. The Boston real estate lawyers at Pulgini & Norton offer legal advice and representation to homebuyers, sellers, lenders, and others. An amortization schedule is a table that shows how much principal and how much interest the periodic loan payments go toward paying off. This is different from a payment schedule that simply shows the dates of payments and the amount of payment. The payments schedule will not describe how much of your payment goes toward the interest versus how much goes toward the principal. The loan's principal is what was borrowed. The interest is the cost of borrowing the money. In an amortized loan, the payments are not equally split between interest and principal. Instead, borrowers will start by paying more interest at first and leaving principal for later. In an amortized loan, the borrower's periodic payments are the same amount early in the process, but initially the schedule will show that most of the payments go toward interest. The percentage of the payment that goes toward interest is reduced slightly with each payment, and the percentage that applies to the principal increases. Eventually, as time passes on the schedule, the principal is reduced to the point that you do not need to pay much interest, and the payment will mostly apply to the principal. The last line of the amortization schedule will show the total interest and principal payments for the term of the loan. Both lenders and borrowers may use the amortization schedule to see what will be owed on the loan over time and make future plans. An amortized loan always pays off interest before paying and reducing the principal, which is different from loans that have negatively amortizing payment features, interest-only payment features, and balloon payment features. Understanding an amortization schedule is important because you might have the opportunity to pay off a loan early or make some pre-payments. Moreover, an amortization schedule will let you know how a pre-payment will be applied. If your early pre-payments go toward the principal, they may reduce how much interest you pay in the long term. However, if you make a pre-payment later, it may not save you a significant amount of money because you have also paid off your interest. 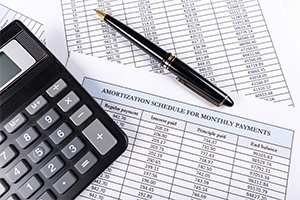 For Massachusetts homebuyers, it may be important to have an amortization schedule. At Pulgini & Norton, our experienced Boston real estate attorneys can negotiate with other parties and advise you on the impact of pre-payments on your amortization schedule. We also assist buyers, sellers, associations, and lenders in Brookline, Quincy, and Medford, among other communities. Contact Pulgini & Norton by calling us at 781-843-2200 or filling out our online form to set up an appointment with a home financing attorney.